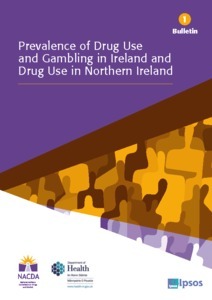 Home > Prevalence of drug use and gambling in Ireland & drug use in Northern Ireland. Bulletin 1. National Advisory Committee on Drugs and Alcohol, Northern Ireland. Department of Health. (2016) Prevalence of drug use and gambling in Ireland & drug use in Northern Ireland. Bulletin 1. Dublin: National Advisory Committee on Drugs and Alcohol. This Bulletin presents the key findings from the fourth drug prevalence survey of households in Ireland and Northern Ireland. Within Ireland the survey sampled a representative number of people aged 15+ from August 2014 to August 2015. Within Northern Ireland a representative sample of persons aged 15-64 years was selected. The survey was carried out according to standards set by the EMCDDA. Data relating to drug prevalence on a lifetime (ever used), last year (recent) and last month (current) basis for Ireland, Northern Ireland and the island of Ireland are presented in this bulletin. Statistically significant changes in prevalence rates between 2002/03, 2006/07, 2010/11 and 2014/15 are presented in the tables and comparisons between 2010/11 and 2014/15 are discussed in each section.